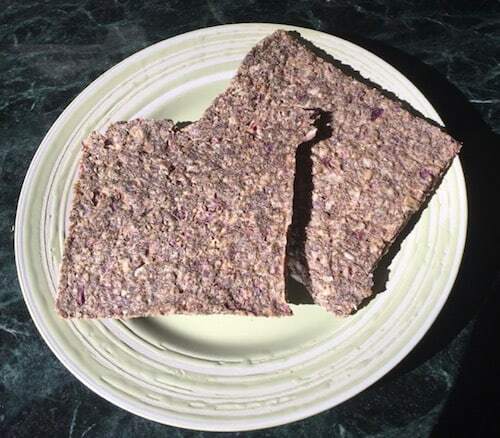 For years I made a raw onion bread with flax seeds and sunflower seeds. There have been times when a batch was in the dehydrator every week! The recipe I used called for 1/2 cup of olive oil, and since cutting most refined oils out of my diet, I needed to change the recipe. Add to that that I was low on flax seed and wanted to incorporate chia. I found this recipe that uses just 2 tablespoon of coconut oil, and I adapted it to the other ingredients I had available. This recipe doesn’t give as crisp a bread as the recipes I’ve used in the past: it’s more bread-like and less cracker-like. It’s perfect for sandwiches or avocado toast! Of course, it’s naturally gluten-free. You really need a food processor for this recipe to get the onions the right consistency. Or, if you have a lot of time on your hands, you can grate the onion. 2 lbs onions (I use red onions, but use your favorite variety), peeled and quartered. Pulse the onions in food processor until they are finely minced, but not mushy. Place in a large bowl. 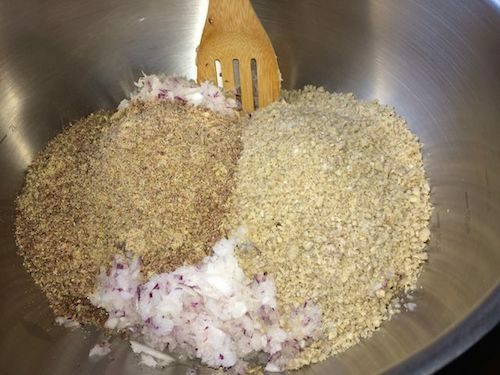 Grind the flax seed, chia seed, and sunflower seeds separately, then place in the bowl with the onions. Stir to mix well. Pour the coconut oil over the onion and seed mixture, and stir to combine. Add the soy sauce and nutritional yeast to the bowl and mix well. The mixture should come together and be firm but wet enough to spread. On a dehydrator tray with a teflex sheet, spread 1/2 the mixture as evenly as possible. Wet hands will make it easier. Repeat the process with the second half of the mixture on another teflex-lined tray. Turn the dehydrator to 140 degrees (F) and allow the bread to dehydrate for an hour. Remove the trays and gently score the bread with a knife (not a sharp knife!) to make nine pieces on each tray. Reduce the dehydrator temperature to 118 degrees (F) and dehydrate three more hours. Flip the bread over and continue to dehydrate about 6-10 hours, or until the bread is firm and no longer sticky, but still pliable. Store in an airtight container. I prefer to store mine in the fridge because it stays crisper.